CITYZEN IS CLOSED. Executive chef Eric Ziebold endorses American fare --- and his cooking wins over Washingtonians. : CITYZEN, A FORMER GAYOT TOP 40 RESTAURANT IN THE U.S., HAS CLOSED. 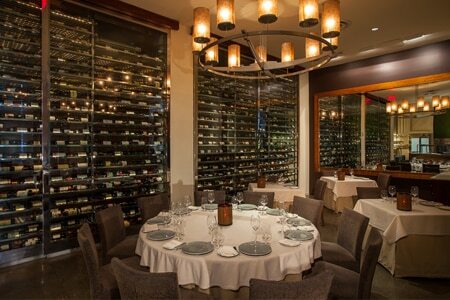 Power, money and fine dining converge in a single space at CityZen, located in the Mandarin Oriental, Washington DC. Service rules, with a staff that cares about the correct placement of cutlery, the presentation of courses, and the speed with which all of this is carried out. Executive chef Eric Ziebold’s American cuisine is offered via three menus: a four-course prix-fixe ($90), a six-course chef’s tasting ($120, add $85 for wine pairing or $135 for upper-tier wine pairing) and a six-course chef’s vegetarian tasting ($110, add $85 for wine pairing or $135 for upper-tier wine pairing). Starters may include sunchoke agnolotti, navel orange and crispy mustard greens. Sautéed Florida sheepshead, coconut-infused jasmine rice, and shrimp and cilantro gremolata might follow. And don’t forget to consider the artisanal selections stocking the cheese trolley. The green tea and white chocolate sponge cake, chestnut honey cream and chestnut ice cream will end things on a sweet note. Look to the sommelier for advice when perusing the wine list. As it turns out, CityZen really begins to buzz at the socially chic hour of 10 p.m. Another option for something a little more off-the-cuff: a three-course bar tasting menu ($50, add $25 for wine pairing).